The publisher sent us a copy of this book. Think your life is hard where you live? 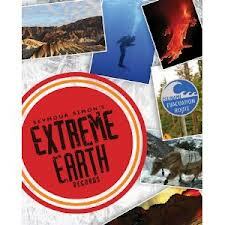 In Seymour Simon's Extreme Earth, readers will travel to the coldest, the hottest, the deepest, the highest, to the rainiest place and explore the most extreme places on Earth. Simon not only includes amazing destinations but amazing records, as well as some ‘mind-bending’ facts. Located in the South Atlantic Ocean, partway between South Africa and South America, the tiny island of Tristan da Cunha is the remotest place on Earth. The small volcanic peak has a population of approximately 300 people who share the island with a dozen species of seabirds, including the rockhopper penguin and several kinds of albatross. In 1961, a volcano erupted and all of the inhabitants left, only to return in 1963 when it was safe. It now has a post office, hospital, school, and crayfish factory. It has it’s own postal code from the United Kingdom, TDCU 1ZZ, and the stamps issued at the island post office are collected around the world. Do you know the name of this small island’s capital? It is Edinburgh of the Seven Seas. When snowfall is measured regularly, the snowest place on Earth is the Paradise area on the south slope of Mount Rainier in Washington State. The average snowfall there is 56 feet (17 meters) per year. “That’s about the height of a dozen children standing on each other’s shoulders.” But, the place where the most snow fell in a 24-hour period was at Silver Lake, Colorado when a blizzard dumped 6 feet (1.8 meters) of snow on April 14, 1921. The book boasts beautiful color photographs on every page, and many side bars of facts. Did you know that Antarctica contains more than 90 percent of Earth’s ice? As of this writing, some of the ice sheets are 2.5 miles (4 kilometers) deep.They believe that some of the ice may be more than 100,000 years old. Seymour Simon is a prolifict author of more than 250 books about science. Lucky for us, he is an author we can trust will offer consistency and quality in his books. His Extreme Earth Records will be popular with those children who enjoy world records or love reading books full of facts.